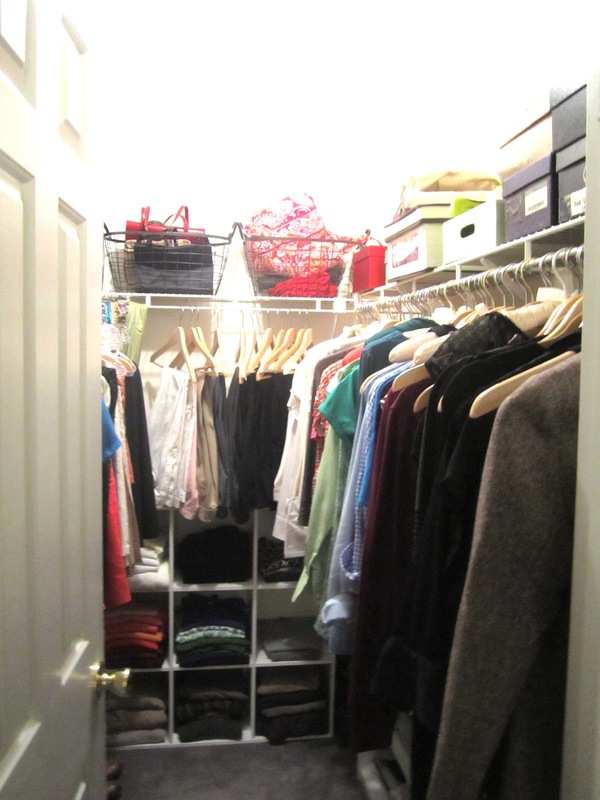 My master bedroom closet. It is time. Shameful. Utterly, positively, absolutely and without question shameful. I am usually extremely organized, but this closet was one area that I just never got around to organizing. 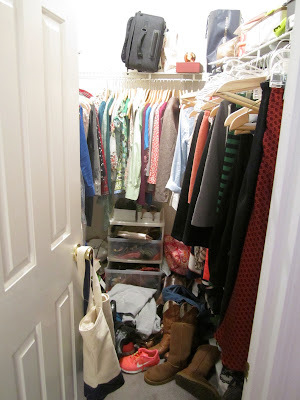 In my defense: I knew I was organizing my closet this particular day, so for the two (ok, three. Ok, probably more like six) weeks leading up, I did not bother putting anything away. But still. I have been in my home since April and have been putting off this space since then. The problem is the effort and time required in creating order from chaos: the only way to whip this closet into shape is to take everything out and then carefully put everything back in, while editing the contents at the same time. I took advantage of a super cold weekend and did just that. I really wanted this to be done in one day, but alas, it is not. I still have some work to do. Here's what I did. 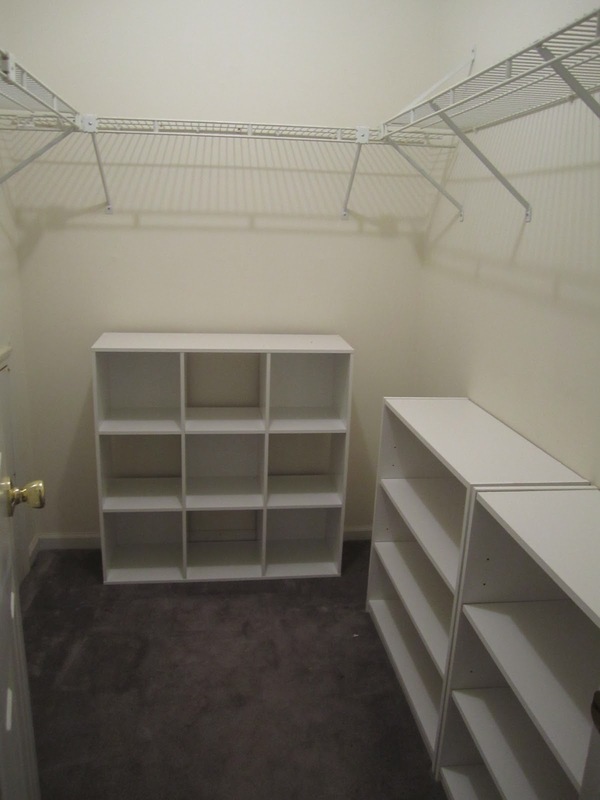 First, I took every single thing out of the closet and put it in my room. This isn't even all of it. I had to pile my skirts on Little's bed and my pants on Big's. Wow do I have a lot of clothes. I think I am a clothes horse. Neigh. I eventually want to paint the space and update the light fixture, but I decided to tackle that project down the line. For now, it will do as is. I took stock of what worked and what didn't. The little shelves on the right that I had been using for my sweaters did not work at all. So I grabbed a shelf from the kids' playroom that had more division in the space (one of those Cubical units from Target) and pushed it in the back. This will keep my sweaters much more orderly (and I am heading to IKEA soon to get a tall bookshelf for the playroom, which is sorely needed). 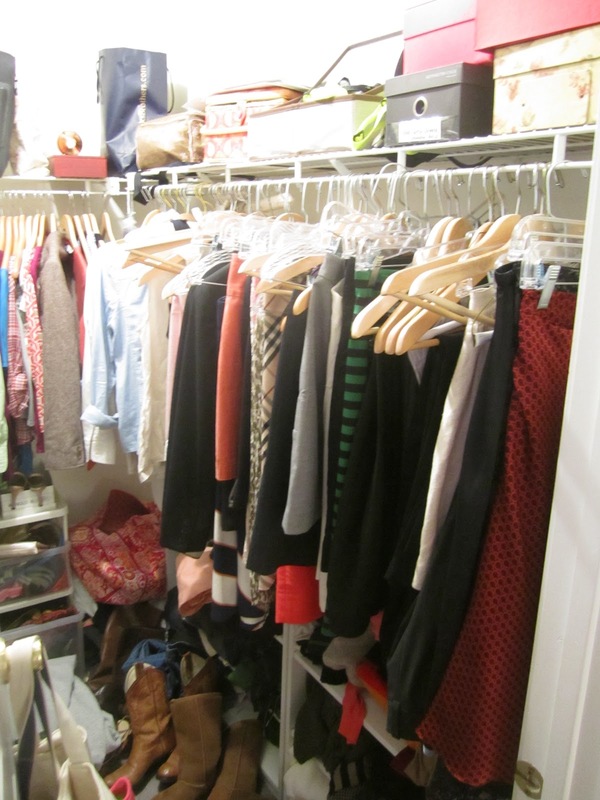 Before I got down to the nitty gritty of organizing and editing my closet, I made a few repairs in the space. The little shelf hooks were coming lose, or had completely fallen out, so I fixed those spots while I had the closet empty. I was able to get these replacement hooks/anchors at my local hardware store. Sweet! 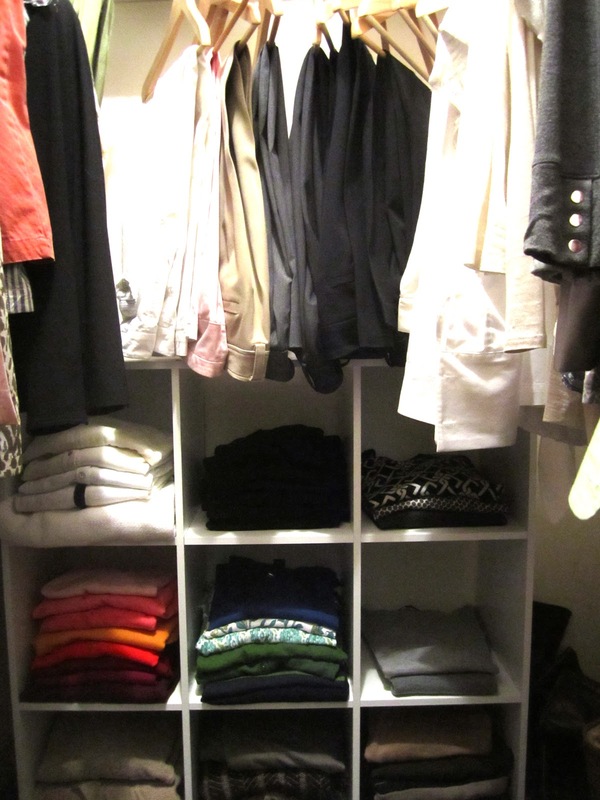 I organize my closet by both type of clothing (e.g., shirts together, skirts together, dresses together, etc.) and color within that style. I know I'm not alone in this. 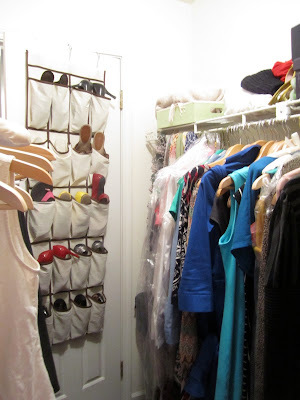 I also went through and made sure all of my clothes were on the right hangers. I have a mix of wooden ones, those pretty satin ones for delicate items and the slim velvet ones for items that tend to slip off. It was time to bring things back in. First, I went through my sweaters. I put the sweater shelf on the back wall so it was easiest to see. I culled through my sweaters and donated a handful. But then returned them to the shelf in color order. 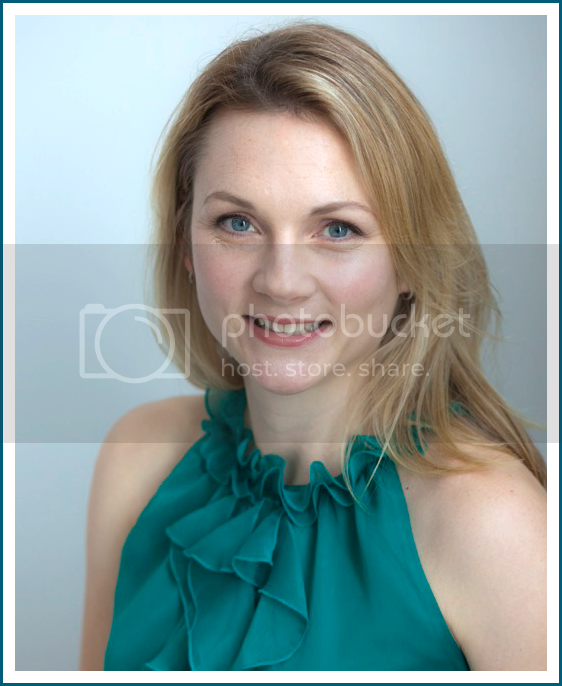 Oh so pretty. Now it was time to hang things. 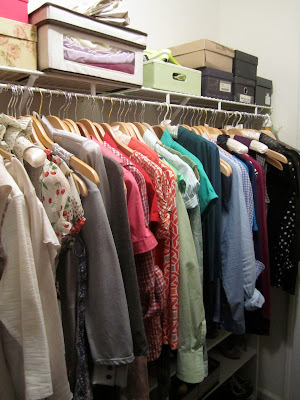 I went through all my shirts first: they went along the long wall in color-coded order: white-grey-pink-ROYGBIV-brown-black. Then pants along the back wall over the sweaters. Then skirts and dresses along the left wall. Here is everything back in place. Once the clothes were back in, it was time for the top shelf around the perimeter of the closet. I wanted to keep this area nice and neat. I took stock of what was up there and brought in a few organizing pieces (baskets, bins, etc.). I'll take another day and work on those top shelves. I bought some pretty baskets and bins recently and they are just begging to be filled. Next up was shoes. I took the hanging thing off the door and moved the shoes all together on a white shelf. Fancy evening shoes are on the top shelf. This is much more functional. I used the other white shelf for jeans, cords, sweats and shorts. I still have to figure out my sneakers and active shoes - right now they're in a bag. I need to figure out my scarves and belts. Right now, the scarves are hanging near the pants and the belts are still in this little plastic set of drawers. I'm pretty sure I want to move my sneakers and running/triathlon gear into the drawers where the belts are and figure out a better solution for my belts. This project is not yet done, but I've made great progress. 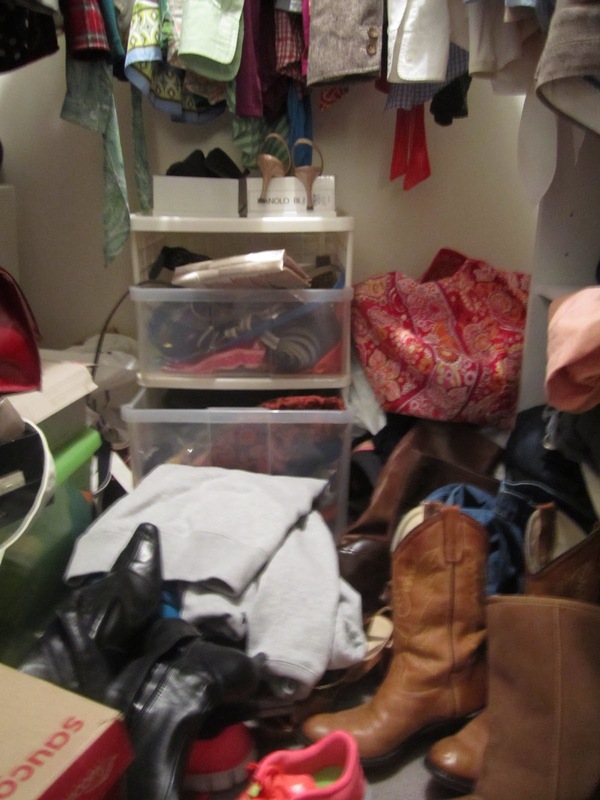 The top shelves of the closet are a little disorganized, well, more disorganized than I'd like. It's neat up there, but I want to make it even better. I also need to work on some of the floor space. But for the time being, I'm so happy. La la la la la. Eventually I'd also like to paint the walls, add a pretty light fixture and put down a cute throw rug in the center. But for now this is deliciously perfect. Wow! Amazing improvement. 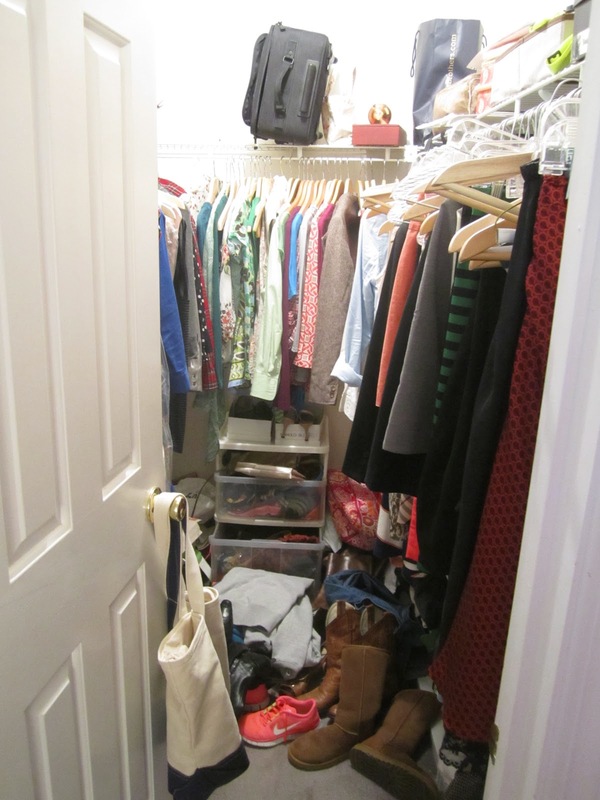 My closet is also a scary disaster. 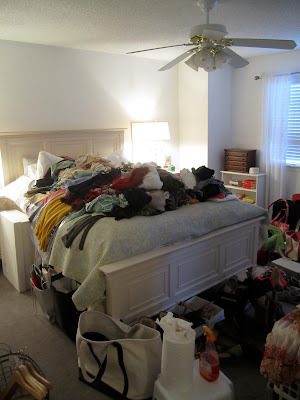 I also want to do this-- dump EVERYTHING out and go through it and cull and put things back nicely. That is the dream. I'm sure there are belt storage options out there. We only have a few, so I just but the buckle through the very top hook of a hanger and hang by the pants.